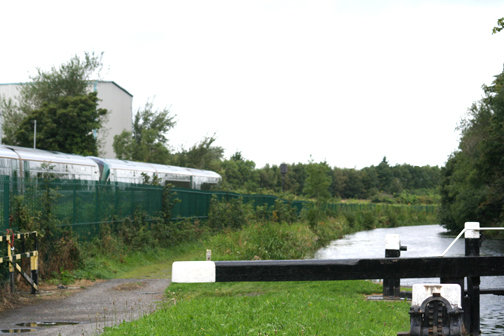 This is a stretch of the Royal Canal that runs alongside the railway line in Ashtown near Cabra West. A train can be seen in the picture heading off towards Mullingar. It was along this stretch of the canal that my pals and I would ramble in search of an orchard. Somewhere along this canal bank we’d come across the rere of the girls home run by the nuns and it was here that we’d climb into their orchard. Once we were in we’d tuck our jumpers down the front of our trousers. That was so the apples we shoved through the neck of the jumper wouldn’t fall out. One of the lads would stay outside on the canal bank and watch out for any rossers or Garda who just might happen to stroll along. Everyone shared their apples with him. Like a small band of locust we’d pick out a tree and proceed to strip it clean of all it’s apples. Most of what we robbed we gave away to other kids that we’d meet on our way home. Other times we’d make a raid on the Ashtown Tinbox Factory nearby. We’d always take armfuls of round tin discs that were used as lids on cardboard tubes. Or else we’d fill our pockets with them. On our way home along the canal we’d skim the lids across the surface of the water just for fun. The stone bridge that spans the canal at Ashtown is actually called Longford Bridge and was built in the 1790’s. When we came here as young boys Ashtown was out in the middle of the country. Now it has it’s own new village of shops, apartments, houses and quite a large population.